Ever seen a giant shoe ? Well how about a gigantic shoe on wheels ? 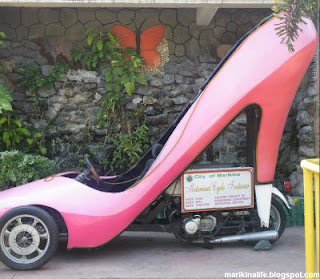 Marikina City, known for its progressive shoe industry, has built a unique pink high heel shoe which is actually built on top of a tricycle framework. 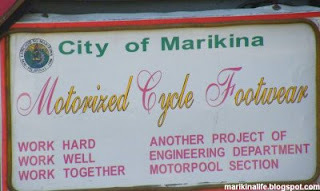 It's officially called Motorized Cycle Footwear, built by the Engineering Department of Marikina. The pink color and shoe both represent the spirit of Marikina City combined with the creativity the city constantly shows via its city projects. When this shoe goes to the streets, may be you could sing this song to the tune of "These Boots Were Made For Walking"
are gonna roll along with you"
matagal na ito nasa Marikina... i've seen this parked in several places from time to time. :) it surely attracts attention especially when on the road. Sir, I'm rose, a researcher for a TV program. I've sent you detailed e-mail in jaydjesus@gmail.com, inquiry and request for our show, regarding this motorized shoe you wrote about.